Well, the holidays just passed and so we had a lot of "get together's" and parties to attend- friends and family mean a lot to us, so we really try to make it to every single one! Not being one to arrive empty-handed, I enjoy bringing desserts for that party to enjoy. Sometimes I even try out new recipes or flavors of things on the guests and see what everyone thinks! Bwahahahahaha. Back to the marshmallows! So a friend of mine suggested that I make homemade marshmallows a little while back- she's a big fan. Ding! A light in my brain went off and I could have slapped myself in the face! How could I have forgotten about these little delights?! So of course they would be made!! If you have never had a homemade marshmallow...I have to be honest- you are truly missing out on one of the yummiest things. They are ABSOLUTELY NOTHING like what you find in the store. I'd even step out and say, store bought marshmallows give a bad name to what they really taste/feel like/are. Little pillows of sweet clouds. That's what a homemade marshmallow is to me. They are so soft, absolutely fluffy, and just perfectly sweet. AND, at virtually fat free, they couldn't be better! I must say though, they absolutely are not sugar free!!! Moving on- what's even better is they are so versatile; you can flavor them pretty much however you like. I know this recipe looks a little wonky with all the double measurements of ingredients, but stay with me- I promise it'll make the fluffiest, most tender, yummiest marshmallows! You can also spice these up with a little peppermint extract or any extract you love, really. Let them become your own thing! 1. Lightly butter or spray two 9x13" pans, cover bottom with parchment or wax paper, and allow excess paper to come up sides (for easy removing of finished product). Lightly butter or spray once more. Set aside. 2. Get out your stand mixer bowl, and add your 3/4 ounce of gelatin and first 6 ounce measurement of water. Set aside and allow the gelatin to "bloom"- powdered gelatin will soften, thicken, and absorb all of water. Should take about 5 minutes. 3. While gelatin is blooming, get a sauce pot out and start to simmer an inch or two of water in it. Once gelatin has bloomed, place your stand mixer bowl over your simmering water (with bloomed gelatin in it), thus creating a double boiler. Gently dissolve your gelatin. Set bowl back on stand mixer. 4. In another sauce pot, add second 6 ounce measurement of water, 2 cups of sugar, and 3/4 cups of light corn syrup. Bring to a boil and add a candy thermometer. Cook this mixture until you've reached 240°F. 5. Once your sugar mix has reached 240°F, remove pot off the heat and add your 1/4 cup measurement of light corn syrup. 6. Begin whipping melted gelatin with a whisk attachment on medium-low speed. While mixture is whisking, slowly and carefully begin to add your hot sugar mixture. Once all of your sugar mix has been added, add the scraped out seeds of 1/2 a vanilla bean, salt, and turn up speed to medium high. Whisk until light and fluffy- about 15 minutes. 7. Quickly spread marshmallow mixture in your two greased and papered pans, smoothing out top, and allow to sit room temperature until set- 30 minutes to 1 hour. 8. Once set, remove marshmallows from pans by grabbing your excess paper and flip over onto a cutting board that has been lightly dusted with corn starch/powdered sugar mix. Cut into squares with either a greased knife or greased cookie cutter. Grease your cutter after each cut. 9. Take each square or cut piece and toss with your mixture of half corn starch/half powdered sugar- until all surface has been lightly coated. Dust off excess powder. There you go! 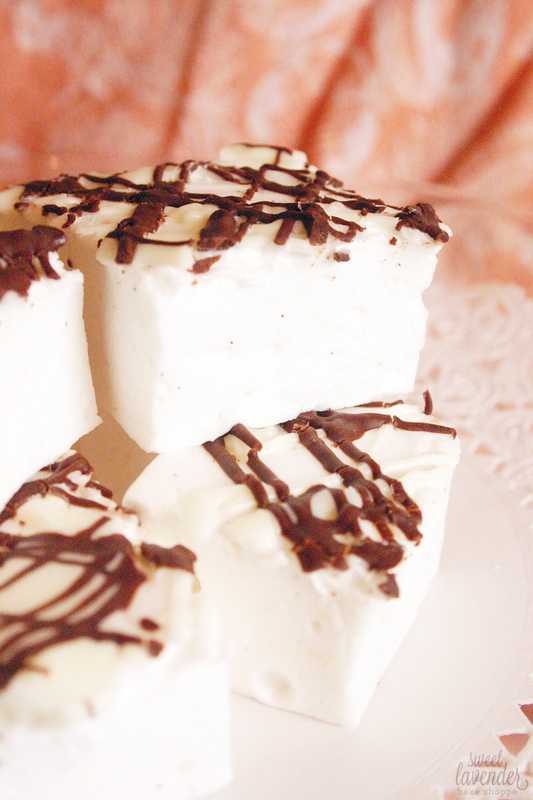 Homemade marshmallows. 10. Over a double boiler, gently melt your white chocolate (remember- white chocolate melts at a way lower temperature than regular chocolate- so be careful of over heating!) Once melted, remove from heat and drizzle (with a fork) over your marshmallows. 11. In a separate bowl over your double boiler, melt your milk or semisweet chocolate. Once melted, remove from heat and drizzle over your marshmallow pieces. Allow chocolate drizzle to set up, room temperature, before packaging or placing on top of each other. * Can also dip half or a corner of each marshmallow into your melted chocolate if you'd rather! * Perfect for homemade hot chocolate or packaged as edible gifts! * Keep at room temperature only! Will last this way, in air tight container for up to 2 weeks. OH MY WORD. Yes. Need to make these. I love making homemade marshmallows! One of the best things in the world! Oh, these look amazing. I made marshmallows last year, and I have no idea why I haven't made them recently.